THIS BLOG POST IS THE THIRD IN A THREE-PART SERIES. READ PART 1, AND PART 2. In Part 1 of this blog series, Nico wrote about La Palma y El Tucán’s (LPET) impressive social impact. In Part 2 he outlined LPET’s rigorous approach to quality. In this final blog post, I will tell you about BIODIVERSAL, a new project from the founders of LPET which seeks to support coffee growers and their land by diversifying and marketing their crops. Coffee has been integral to Colombia’s rural economy for decades, but its current model is unsustainable. With the C-Price at an historic low, farmers struggle to cover the cost of their production. For some, it seems if they want to put food on the table their two options are to stay on their farm and grow a more profitable crop, often illicit products like coca, used in the production of cocaine. Alternatively they can head to the city where there are more economic opportunities. “As the average age of coffee farmers rises above 60 and their children seek non-farm employment or migrate to cities, the coffee sector will lose its viability,” said Felipe Sardi, cofounder of LPET. Additionally the mono-culture farming often practiced today is depleting the soils and requires more and more expensive chemical inputs. “We are convinced that coffee alone cannot generate adequate income to enable sustainable progress out of poverty or opportunities for the next generation of farmers,” Felipe said. They also see that monocultural coffee production is environmentally damaging, and vulnerable to global warming, which threatens to reduce viable coffee growing land in Latin America by 88% by 2050, according to the SCA. Felipe and cofounder, Elisa María Madriñan, see crop diversification as the answer to many of these issues. This involves cultivating other agricultural products in addition to coffee, to give farmers an additional source of income, and reduce the environmental impact of monoculture agriculture. Of course, this is LPET, so rigorous processing to uphold the highest quality in all products is the foundation of their project, giving farmers access to specialty markets for all of their crops. This is the core ideal behind BIODIVERSAL. “It brings forward a diverse pool of value-added agricultural products cultivated and sourced in a way that protects the community and the environment,” Felipe explained. While this appears simple on paper, it involves great risk for the producer. Many come from a long line of coffee growers, so coffee is the crop they understand. Removing coffee trees and planting alternative crops presents many challenges, they may not know what will grow well on their land, or have access to the market for that agricultural product. With BIODIVERSAL, Felipe and Elisa plan to raise capital for the necessary agricultural research and development, to learn the highest standard processing methods, and to find the specialty markets for these new products. Farmers are the production experts and caretakers of our ecosystems. Experienced entrepreneurs and investors bring the capital and experience to create value-added products through investments in technology and innovation. Conscious consumers support the project by seeking quality and the highest standards of ethical and ecological principles in the products they purchase. BIODIVERSAL will begin with a pilot project, working with twenty small-scale farms located around LPET´s farm in Cundinamarca, Colombia. The team have already leased a two hectare farm that meets all the characteristics of an average coffee farm in the region. They plan to implement four different BIODIVERSAL farming designs that will include over 24 species in addition to coffee. The results of these experiments will be shared with the local community and farmers. Farms will be divided into four groups, five farms will replicate one design, so that twenty farms can help test all four designs. Sixteen farms have already signed up for the challenge, all of which belong to LPET’s Neighbors & Crops Program. Following Colombia’s peace agreement and the withdrawal of FARC guerrillas from many parts of Colombia’s countryside, Felipe and Elisa see an opportunity to bring this new approach to conflict-prone areas. This could help farmers transitioning into legal crops create a more sustainable business model, strengthening peace in one of the world’s largest coffee producing countries. THIS BLOG POST IS THE SECOND IN A THREE-PART SERIES. READ PART 1, AND PART 3. In Part 1 of this blog series, I wrote about La Palma y El Tucán’s (LPET) impressive social impact. In this blog post, the second in a three part series about LPET, I will dive deeper into the strict methodology and innovative processing behind the stellar cups that have earned LPET an impressive reputation for quality. When LPET began in 2012, the founders, Felipe Sardi and Elisa María Madriñan were convinced that varieties like Castillo, known for their disease-resistance, but not for their cup quality, had the potential to produce delicious lots, if they were picked selectively and processed well. Starting a farm from scratch meant that the pair could design both the processing facility, and the methodology, with quality as the number one priority. This is the vision behind LPET’s Neighbors & Crops program (N&C). To ensure perfect ripeness, the cherries destined for the N&C lots are picked by LPET’s own team of highly-trained women who select only the ripest cherries. (The deep cherry-red nail polish they wear helps them identify the perfectly ripe fruit!) The cherries are then transported by truck to the LPET farm for processing. Due to the very small size of their farms, a single N&C producer is unlikely to produce sufficient cherries in a single day to fill a ten bag lot, so lots are usually composed of cherries from five or six different producers. The lot will keep the name of the producer who has the most cherries in a single lot. Checking the pH of the lots. Each lot will be tracked and recorded. At the farm gate an LPET team member notes the weight of cherries. At the station gate they measure the pH and sugar content. All this information is recorded on a physical tracking sheet for each lot, and transferred to a spreadsheet. This is essential data which they can use in the future. For example, this year the team reviewed every cupping sheet for the lots they produced in the last five years. They identified the best lot for cup profile and scores, and noted the relevant data including brics, pH, and time spent fermenting. With this data they created several “recipes” which they applied to cherries delivered this year. If you get a chance to cup the incoming fresh crops from LPET, you will understand the positive impact this rigorous approach has on quality. After the cherries pass the quality controls, they will undergo lactic pre-fermentation, water sorting, depulping, fermentation, washing and drying. To share all the details of these processing method is a blog post for another day, but we can at least tell you about their star process: lactic fermentation. What is LPET Lactic Fermentation? LPET lots show extremely diverse cup profiles. From a juicy tropical punch to a rum raisin syrupy shake, they can fit all preferences and curiosities. This is due to the extremely “picky-picking,” the state of the art equipment of their processing facility, and the knowledge of the whole team. Additionally, a large chunk of credit must go to this innovative Lactic process they have mastered over the years. A unique acidity structures each lot with its milky or winey tones, bringing a heavy body and a sparkling touch to the cup. Sweet cherries ready to ferment! Before depulping begins, cherries are placed in a closed tank. Sugar content, temperature and pH are noted. The high sugar content of the perfectly ripe cherries provides ample food for yeast and bacteria naturally present in the air and on the cherries, so fermentation begins. One by-product of this fermentation is carbon dioxide. As the tank is closed it will slowly fill up with CO2 and the air will be chased out. Under these anaerobic conditions (meaning without oxygen), the bacteria that survives will produce lactic acidity, hence the name. For Lactic Fermentation, LPET will leave cherries fermenting in tanks for approximately 70 hours before depulping. An easy way to see if cherries have been through a lactic fermentation is to look at the beans after depulping. If everything went well, a bit of alcohol was also produced during the fermentation, transferring some color from the pulp to the beans. The quality control is not finished yet. After drying and milling, each lot, be it a Neighbors and Crops micro-lot of 350kg, or a Heroes Series nano-lot of 25kg, is sorted again by hand with the objective of achieving zero major and zero minor defects. Perfection is always the goal. All of these sorting steps give us an incredible ratio of cherries to green of 1:8,5. On average, LPET needs 85 kilos of cherries to produce ten kilos of green. Think about that on your next sip! Innovation never stops behind this farm’s doors, ambition to improve is always carrying them forward. We are more than happy to chat to you about this project by phone, or over a coffee when we see each other somewhere on our beautiful home planet. This season, we have fifteen stellar lots for our customers in Europe. The first ten lots are ready to go and will arrive in Hamburg early December. Five additional lots from the late harvest are being processed as I write this. Expect those around February 2019! Nine lots have been already booked so hurry, before they all go. To book your LPET Neighbors and Crops lot, contact me at nicolas@collaborativecoffeesource.com ! Read Part 1 of this blog series here. This blog post is the first in a three-part series. Read Part 2, and Part 3. I could probably write a book about La Palma y El Tucán (LPET). Instead I will limit myself to three blog posts. I was lucky to travel to the LPET farm in August to make the CCS 2018-2019 selection, along with my team mate, CCS Global Buyer, Matt Hassell. Together we went behind the scenes to discover the strategy, science and hard work behind these stunning coffees. In Part 2 of this blog series I will tell you about the famous processing and the laser focus on quality, and yes, we will review the crazy varietals they grow on their eighteen hectare farm. In Part 3 we will learn about LPET’s plans for increasing biodiversity and protecting farmer incomes with a new project. Here in Part 1, what I really want to share with you is the positive social impact that the LPET team have on the local coffee growing community. Felipe Sardi and Elisa María Madriñan bought the LPET farm, located at 1600 masl in Cundinamarca, about 2 hours away from Bogota, and planted trees between August and December 2012. They employ 22 permanent workers and 60 to 70 seasonal pickers for the harvest. The farm is eighteen hectares, four of which remain wild primary forest. The fourteen hectares in coffee production are separated into five plots: Typica, SL28, Sidra, Geisha and Java. This is the coffee that will become the LPET Estate and Varietals series, including Heroes Series nano-lots of 25kg. Also on the farm is the state-of-the-art LPET processing facility, where they process coffee cherries purchased from neighboring farms for the Neighbors and Crops Series. The goal of the Neighbors and Crops program (N&C) is to produce finely crafted and diverse cups, while simultaneously helping producers with fair revenues. To understand the LPET payment structure, you first need to understand how most coffee is bought and sold in Colombia. In Colombia, the standard way for producers to sell their coffee is to work with the Federación Nacional de Cafeteros (FNC). Created in the late 1920’s the federation is run by elected members, and boasts over 500,000 members. It is the largest agricultural NGO in the world. One great reason for producers to join the FNC is their guaranteed purchase scheme. On any day of the year, producers can sell their coffee to the FNC at one of over 500 buying stations around the country. The price offered that day is based on the C-Price, with a differential of around 20% paid by the international market for coffee that meets the FNC’s strict export standards. Every week the FNC updates this spreadsheet with the current pricing. For logistical reasons, the price offered will depend on the region. The deeper you travel into the country the lower the price, to account for the logistical costs of transporting the coffee to port. Let’s take a closer look at the second table. This table shows the price paid by yield factor, or “factor de rendimiento.” The yield factor is the kilograms of parchment coffee required to obtain 70kg (a standard bag in Colombia) of green coffee. Lower numbers are the goal, it means there is less that is lost in milling. We see here that for the best yield factor, 89, the price per carga (125kg of parchment) is 834,125 Colombian pesos (COP). With today’s rate it is $263.40 USD, or $2,10 USD/kg of parchment coffee. Felipe and Elisa’s goal from the outset was produce the highest possible quality whilst creating a sustainable financial, social and economic model for neighboring coffee producers in Cundinamarca. The challenges are many. The farmers in their area, about 200 in total, are small holders, most owning one hectare of land or less. With such limited space, it is almost impossible to build a processing facility that will result in high quality coffee. Additionally, the farmers mostly cultivate varieties that are known for their hardiness and disease resistance, but not for their cup quality, specifically Castillo. Plus, the region suffers another major sustainability issue, that is the absence of young coffee producers. Younger generations flock to the cities in search of more stable and profitable livelihoods, leaving an aging population of producers behind. From the very beginning Felipe and Elisa aimed to create a long-term model that addresses multiple problems with multiple innovative solutions. When you travel around the LPET Farm and meet the neighboring producers, it is rare to meet a farmer under the age of thirty. The youngest producer I met was Faustino Reyes. He is 60 years old. His land is adjacent to Dioselina’s farm. Dioselina, who recently passed away, worked together with her neighbor Carmen, who is 83. If you ask any farmer in the region about their children, they always say “they live in Bogota, where they have a nice life and a better job.” The new generation don’t want to work on their parent’s farm. Between the low incomes that coffee offers and the close proximity of Bogotá, a large city with more economic opportunities, it’s a no-brainer for the children of coffee producers in Cundinamarca. The question, of course, is who will produce coffee here in twenty years time? Producer Carmen, Simon (Sales Representative at LPET) and Edwin (agronomist at LPET). The late Dioselina on her farm, August 2018, aged 84. We are deeply saddened by the passing of this dedicated coffee producer. To ensure selective picking, LPET hire a team of pickers that they train themselves. This both guarantees picking of only the ripe cherries, and delivers pickers to the farms when they are needed. The proximity to Bogota, and competition with new agricultural production such as industrial flower crops and palm oil plantations, makes it increasingly difficult to find pickers during harvest. Additionally, coffee producers are competing against coca plantations for labor around the country, especially in the south. Coca is the raw material for cocaine, and “raspachines,” or coca leaf pickers, earn much more than coffee pickers. LPET can guarantee a team of pickers for every producer because they pay exceptionally well. The national average paid for cherry picking is about 450 COP per kilogram (about 14 cents USD). The average fee paid for pickers employed by the LPET Neighbors & Crops Program is around 800 COP per kilo, almost 80% more. Producers do not have to advance the money to the pickers; LPET subtracts the fee for picking from their payment for the cherries. To manage the risks of processing on small lots of land, LPET buy cherries, instead of parchment. This takes much of the work, and the risk, from the producers, allowing them to focus on what they know best: how to produce beautiful and healthy coffee cherries from their land. When buying cherries, it is essential they are delivered to the wet mill promptly to avoid problems with fermentation. This can be a challenge for producers, who may not have immediate access to the required transport. LPET solved this problem by employing a fleet of trucks to collect cherries as they are picked and deliver them to the LPET farm for processing in their high-tech facility. This is a cost that LPET cover, saving the farmers time and money. Finding people to pick your coffee cherries when they are perfectly ripe is one of the biggest challenges producers face in this region. “I ask pickers to come next Monday because my cherries will be perfectly ripe, and they tell me yes, but when Monday comes I don’t see them. A lot of my production is damaged because of that,” says Faustino. For every kilogram of cherries a producer sells to LPET, they receive 1kg of organic compost, created by LPET’s experienced team of agronomists and chemists. This free organic compost saves producers money, and reduces their reliance on chemical inputs year after year. Plus it improves the quality of the coffee. Furthermore, from 2019 LPET will provide additional services to their N&C producers through a sister company called BIODIVERSAL. This company will work with the growing community to diversify crops, building environmental resilience and promoting income protection for growers. Stay tuned for Part 3 of this blog series to learn more! To earn this premium the cherries must pass the quality test. When arriving at the processing facility, Marlon, the Production Manager, measures the number of floaters from a representative sample. Then he removes the under-ripe and over-ripe cherries and calculates the percentage of healthy cherries. Almost all producers get the premium, as it depends mostly on the work of LPET’s own team of trusted pickers. From the second year a producer sells to LPET they receive an additional 25% of the FNC price as a loyalty premium. LPET don’t demand their producers be certified organic, as certification is an expensive and laborious process, but they do pay a premium if their team of agronomists can verify that the producer is using environmentally sustainable practices on their farm. As you can see from this chart, LPET producers have the potential to earn double the FNC price. This pricing structure is the heart of LPET´s sustainable mission. With this income stability, LPET hope to encourage the children and grandchildren of coffee growers to remain in the region and dedicate themselves to coffee. With organic premiums, and the gift of organic fertilizer, they hope to sustain the local environment so it can deliver coffee for these next generation coffee growers, and beyond. Stay tuned for Part 2 of the LPET story - how they achieve those dazzling cup profiles! The “best flavor profile” is, obviously, highly subjective. Mine changes by the hour. I often look for something smooth and chocolatey in the mornings. In the afternoon, give me something lively and exciting. Whatever your profile, it’s likely you can find it in Colombia. The CCS team has been all over Colombia in the last few months. On this trip we visited Nariño, Huila and Tolima as guests of our export partners, Fairfield Trading. I split this trip with Colleen, and met the team in Acevedo. We immediately packed ourselves into one of FFT’s safari-style off-road vehicles and set off for the first farm visit. We soon arrived at Finca Los Angeles, home of the much-lauded Maria Bercelia Martinez. We spent time touring the farm and discussing the many upgrades and additions she has implemented since our last visit. Success, of course, does not come without hard work and innovation, and Maria is a leader in both. In addition to refining the infrastructure (drying beds, fermentation tanks, and her super-impressive custom patio), Maria is experimenting with new varietals and processing methods. From Finca Los Angeles, we made our way west to San Augustin. Fairfield Trading, one of our partners in Colombia, recently purchased and renovated a storefront to become a new purchasing point. This will act as a satellite location for buying coffee, sample roasting and other quality assurance measures, and general business practices. When I say recently, I mean the last coat of paint was drying the night before we arrived! To be among the first to see the beautiful new facility was a spectacular honor. You could see how proud the FFT team was of what they accomplished, and they were so very excited to share it with us. Like their coffee, their hard work on the facility was evident, and they should be proud of the result. Best of luck, Alejandro, Sascha, Ana Beatriz, Eduardo and the rest of the team! Welcome, clients and producers! The inauguration of the Fairfield Trading purchasing point, San Agustin, Huila, Colombia. From left to right, Stephanie and Dillon from Parlor Coffee, Alejandro of Fairfield Trading, Robert William Thoresen of CCS, and producer Maria Bercelia Martinez. With a fresh boost of inspiration from the unveiling, it was time for the guest of honor – the coffee! We spent the next three days at the old purchasing point in San Augustin, cupping just under one hundred lots. Our group was a big one, with CCS customers from all over the globe including Parlor Coffee from Brooklyn, NY, Sey Coffee from Brooklyn, NY, Behind The Cup from Dubai, United Arab Emirates, Reveille Coffee from San Francisco, CA. The space was tight, but with the masterful sample roasting of Esnaider Ortega and direction of Eduardo Urquina, the operation was fantastically smooth. On the table were coffees from Huila including Acevedo (Tarqui, Baralla, and San Augustin), Valle de Cauca (Caicedonia), and Tolima (Planadas, San Antonio and Ibague). The scope of flavor profiles was impressive! The coffees ranged from soft subtle florals, to big bright citric fruits, and even super sweet chocolate/caramel. My time in Colombia was short, but as always, very impactful. I came away from the trip as I normally do: feeling blessed to have the opportunity to spend time and learn from some of the best coffee minds and hardest working individuals in the industry. We are all eager for these delicious coffees to make their way to your hands, and I am already dreaming of my next trip to Colombia. Luckily, the Acevedo Cup is right around the corner! Stay tuned for details. Earlier this month Colleen King, of our US West Coast office, and I visited Valle del Cauca, Colombia. It was CCS’ first official visit to this department which is better known for producing cane sugar, than coffee. 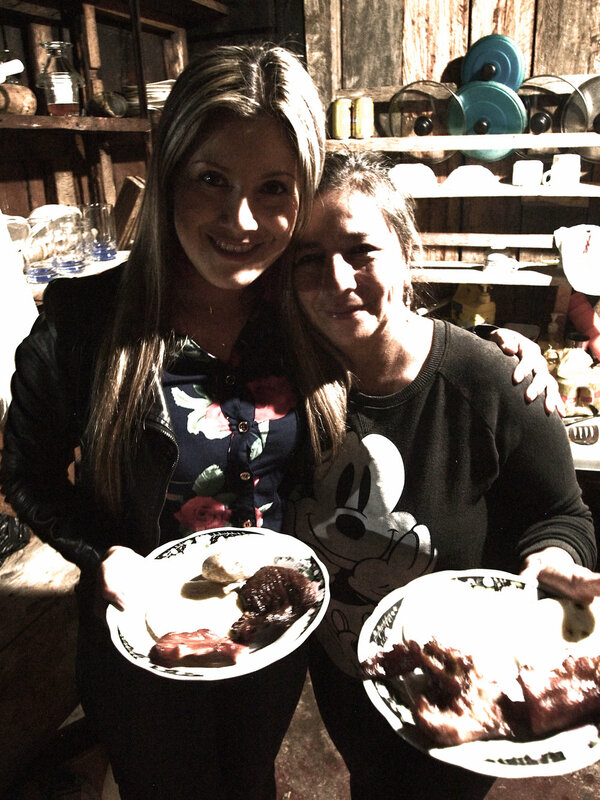 One of the reasons for visiting Valle del Cauca was to meet the women of Café Sello Mujer in Caicedonia. Though they only officially formed in December 2017, the group already have a significant project under their belt: the launch of their own brand of roasted coffee. With the assistance of Cafexcoop mill, the group set a quality standard, and all coffees from the last harvest that met that standard, were blended, roasted, ground and packaged by the mill. This impressive association of women producers has a very clear vision of what they need, and where they want to go. Their number one priority is improving the quality of the coffee. The second priority is increasing visibility of women producers in Colombia. 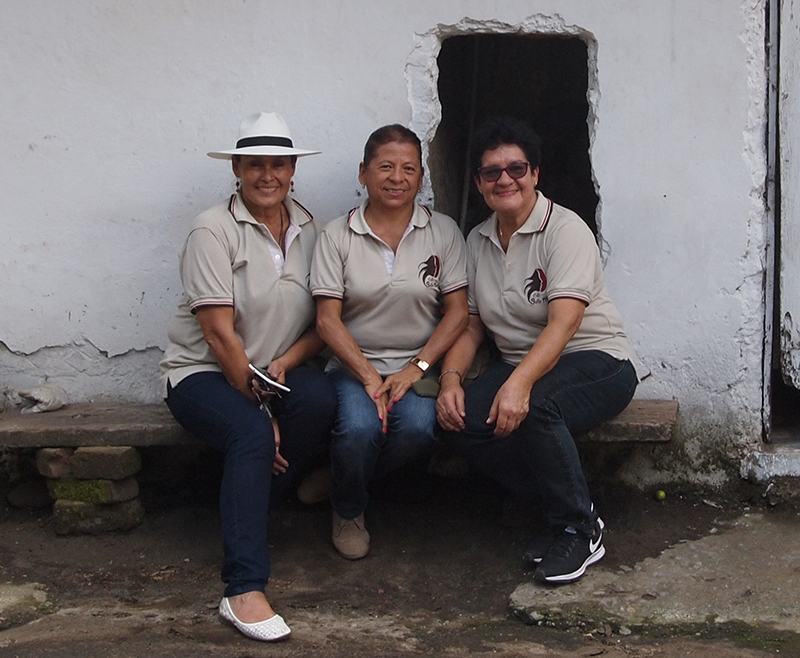 Left to right: Aneth Choronta, Floralba Peña Peña and Amparo Corrales Baena of Café Sello Mujer women's producer association. Eugenia Balanta, Director of the Cafexcoop mill. Eugenia Balanta is the director of the Cafexcoop mill and one of only a few women executives in coffee in Colombia. Eugenia identified several obstacles that women producers face in Colombia that may prevent them from achieving the quality needed to earn a premium for their coffee. Firstly, she said, women struggle to access training programs offered by cooperatives, aid agencies and the FNC. In addition to cultivating coffee, women are expected to care for children and manage the household. If attending a training program requires traveling overnight, very few women can attend, as it would mean leaving their children. Secondly, even when women are cultivating the coffee, their husbands may be the one making the business decisions. This may include whether or not they can enter their coffee into competitions like Valle Cafetero. Esperanza Fajardo of Café Sello Mujer agrees that support from men in the family is essential to the success of women producers. Her husband was waiting outside while we discussed their project and obstacles unique to women producers in societies like Colombia’s. While some may view this as a further suppression of women’s rights, Esperanza and her group see it as true equality. Women and men will always coexist, so cooperation is imperative. The women in this association meet every two weeks, which is a serious commitment, given how far they need to travel. Some of them don’t own a car or a motorbike, so husbands become bus drivers, collecting and returning women from these meetings. At its core however, Café Sello Mujer is about women helping women. They support each other through “mingas” which are working bees, or barn raising events, where the women work communally on projects on each others’ farms. They also plan to harness digital media to tell their stories. 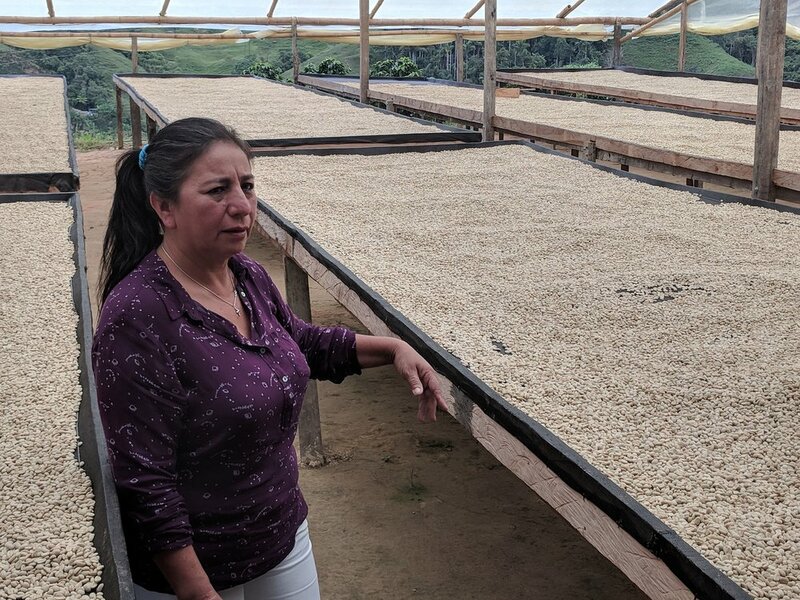 Very often women in Colombia become producers because fathers, husbands or brothers are killed in Colombia’s long running internal conflict, but while this is part of their story, it is not what defines them as producers. Nor do they want to be presented as the beauty queens of coffee. “We won’t dress it up, we won’t be something else, we will tell our stories how we want them to be told,” said member Aneth Choronta. The next coffee harvest in Caicendonia is Dec/Jan, and we look forward to cupping coffee from producers of the Cafe Sello Mujer association. Men wait on "Women's Street" in Caicedonia, Valle del Cauca. 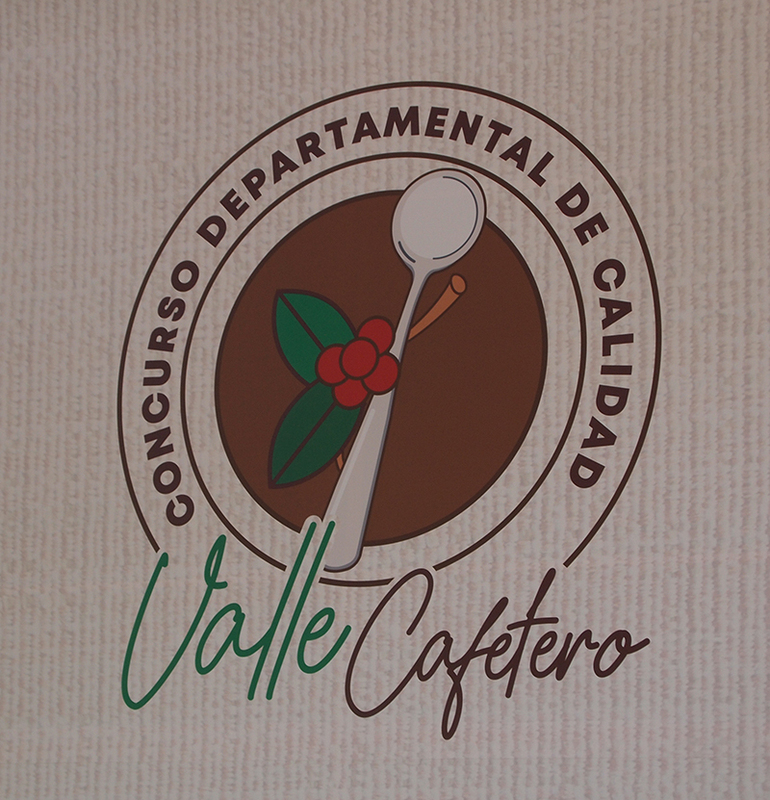 The reason for visiting Valle del Cauca this month was to attend the fourteenth Valle Cafetero competition. 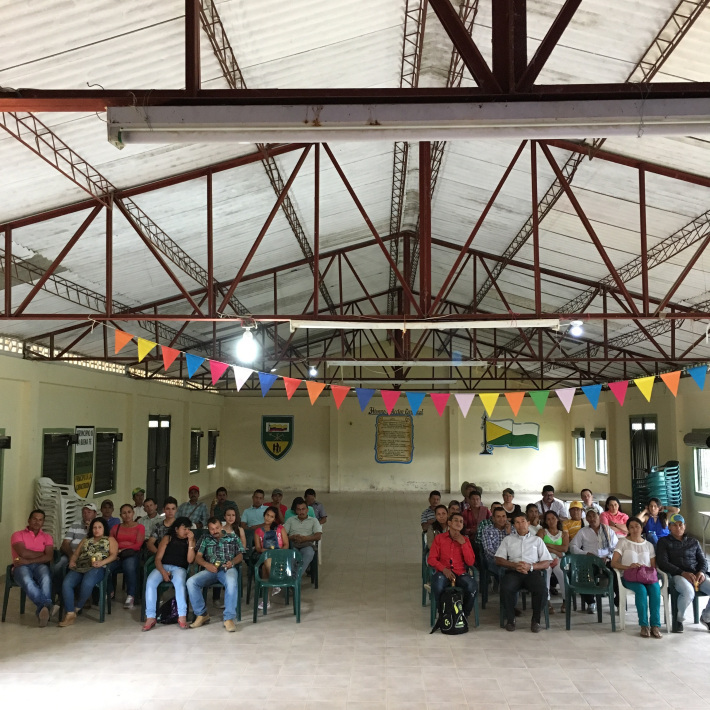 The competition was run by the Cafexcoop mill which is owned by the four cooperatives associated with the Federación Nacional de Cafeteros (FNC). The department is better known for producing high volumes of coffee than high quality, but this competition aims to increase visibility of specialty coffee in the department, and motivate producers to invest in improving quality. Over the last fourteen years of the competition, the scores of the coffees have vastly improved and the range of scores is narrower, suggesting that overall quality is improving every year. Over 190 coffees were entered into the competition. The Cafexcoop team narrowed these down to 30 for the panel of judges. The top three winners received a cash prize and all of the top 30 coffees were up for sale at a silent auction at the award ceremony. Twenty-one of the top 30 coffees were sold during the auction. The lowest priced coffee sold at 30% above the current price in Colombia, while the top placing coffee sold well over 500% of the current price. The majority of the coffees were sold to exporters with South Korean clients. While we didn’t buy any coffees during the auction, we did identify several producers with delicious coffees, and we will be following up with them in the coming months. The event clearly showed this department has great promise. All 30 coffee growers were invited to give a short presentation to the judges before the auction. The intention was two-fold: add value to the coffees by telling the story of the producer, and empower producers to negotiate prices for their coffees. While many of the presentations were more like a sales pitch, such as “my coffee is the best,” the experience was valuable to the producers who described it as terrifying, but also exciting to be a part of the sales process. 2018 was the 14th year of running this specialty competition. Singing the national anthem at the Valle Cafetero 2018 competition awards ceremony. Judges and producers await the awards announcement at the Valle Cafetero 2018 competition. Melba Guainás Bubú, indigenous producer from Florida, Valle del Cauca, presents her coffee during the Business Round. Melba's coffee placed third in the Valle Cafetero competition, 2018. Valle del Cauca is a department located on the Pacific coast, bordered by Chocó, Tolima and Cauca. This department is named after the Cauca river that runs through it, and this river is the basis of their unique approach to coffee cultivation. The National Federation of Coffee Growers (FNC) divides Colombia into 86 “ecotopos” (ecotopes in English) within seven different coffee growing regions. These ecotopos are geographical areas that share the same soil and climatic conditions. Using this guide, the FNC create sustainable development programs, technical and crop forecasting models, and study the relationship between climatic conditions of the ecotopos and the cup quality they produce. In Valle del Cauca, the flowing waters of the Cauca River unite the people, so instead of using ecotopes to determine their coffee sustainability strategy, the department uses “Micro-Cuencas” or micro river basins. Micro-Cuencas are the epicenter of the community and the source of coffee quality. Everyone, whether they work in coffee or not, must do their part to ensure the water is respected, because contamination flows downstream and negatively affects everything: the environment, the people, and ultimately, the coffee quality. Sustainability programs in Valle del Cauca work with the unique ecosystem of each Mirco-Cuenca. They encourage coffee cultivation in harmony with the natural resources, maintaining the balance of the local insect population, stimulating natural fertility of the soil, and conserving the river basin for the future of both coffee cultivation, and the community. Who are La Palma y El Tucán? 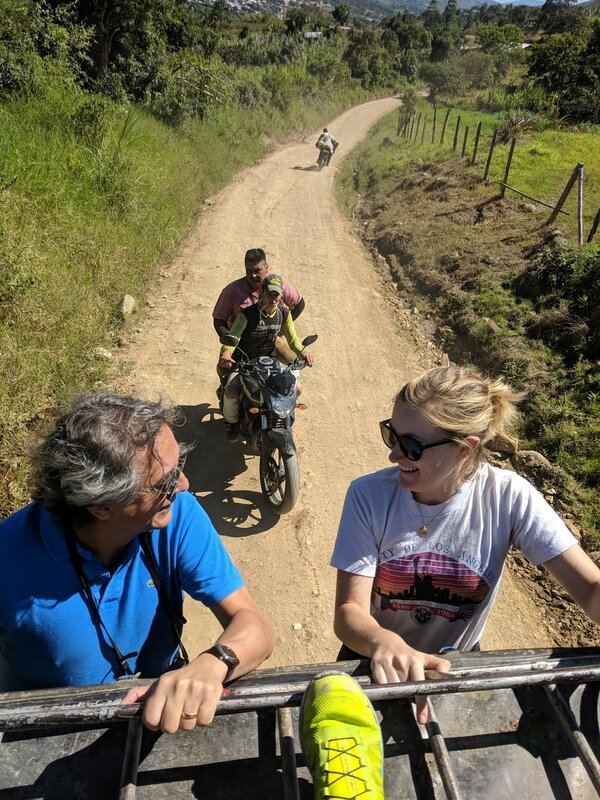 Nico is currently in Cundinamarca, Colombia, at the La Palma y El Tucán farm. He is cupping coffees, discovering the latest innovations in varieties and processing, and finding some time for a few beers and a game of tejo. Follow Nico’s adventures on Instagram. La Palma y El Tucán are pioneering producers from Cundinamarca, challenging the status quo of coffee cultivation and processing in one of the world’s largest producing countries, Colombia. The name comes from two rare species they discovered cohabiting on their land when they purchased the 18 hectare plot: the Emerald Toucan and the endangered Wax Palm. These species live in a happy symbiotic relationship, something the team hope to emulate with coffee and community. Within just a few years, the name La Palma y El Tucán was all over the coffee competition circuit. On their own farm, they grow exotic varieties like Geisha, Sidra and SL28, and experiment with different fermentation techniques to produce unique and sometimes wild flavors in the cup. These coffees are called their Heroes Series, and they continue to attract judges attention at the international level in barista and brewing competitions. All coffees in the Heroes Series score 89 points or above, and are sold in 25kg boxes. Only 100 boxes are available each year, worldwide. See our available Heroes Series lots in the CCS Competition Coffee shop on Cropster Hub. The Neighbors and Crops program was created to help producers with small farms and limited processing infrastructure gain access to the specialty market. 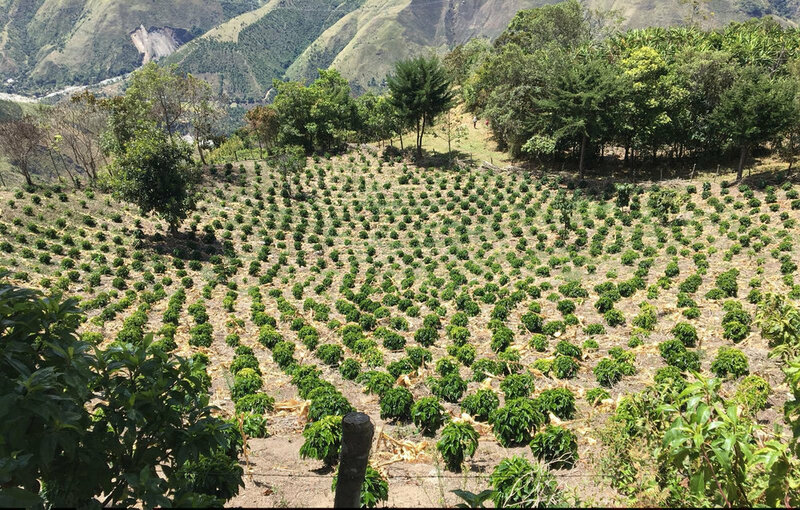 These producers are cultivating typical Colombian varieties including Caturra, Castillo, Colombia, Typica, and Bourbon. LPET buy cherries directly and transport them to their state-of-the-art facility for processing. The team work with more than 70 coffee-growing families located within 10km of the LPET farm. Alvaro Rodriguez, producer for the LPET Neighbors and Crops Series. LPET hope to revitalize the coffee growing culture of Cundinamarca by buying and processing exceptional coffee cherries from farmers who would otherwise not have access to the post-harvest infrastructure required to process high quality coffee. Additionally they invest in innovative practices to protect the local ecosystem. Donations of organic fertilizers created by composting cherry pulp on the LPET farm. In addition to sustaining their community, LPET are committed to sustaining the environment. 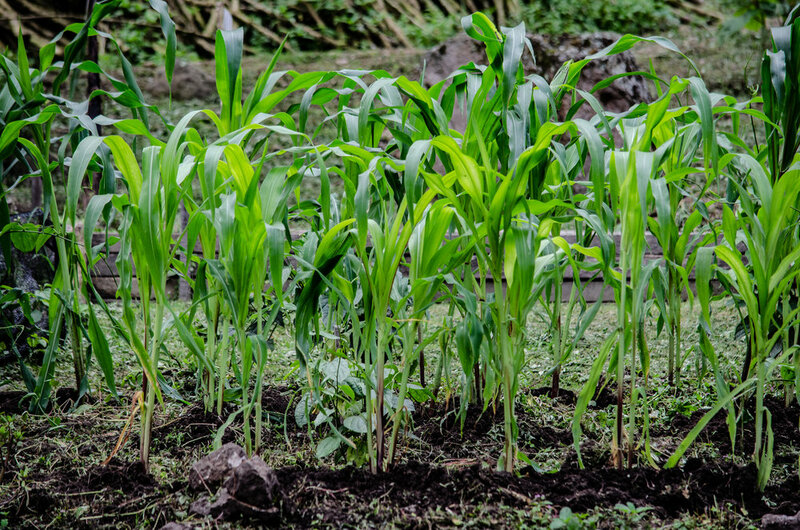 Part of the LPET farm is dedicated to an agroforestry project and the team grow a wide range of complimentary crops, including beans, corn and bananas, nestled amongst perennial tree species including cedar, avocado, walnut and guayacan. This is all done using organic farming methods, decreasing the need for inputs for their coffee trees. The intention of this model is to leave the land enriched and viable, to support the community nutritionally and financially for generations to come. These are small lots of lovingly processed coffees, and from this harvest, we will be offering them as complete lots. Select your producer and have exclusive access to that coffee in Europe. Minimum purchase is 10 x 35kg bags. There are only fifteen lots for all of Europe, and nine are already booked. Make sure you don't miss out, contact Nico to find out what is still available. When all coffees have been booked we will put you on a wait list. To book your exclusive lot from the 2018 harvest, contact Nico. To order current crop Neighbors and Crops, available by the bag, see our Colombian offers list. We will be cupping these coffees at our upcoming Summer’s End Celebration. On Tuesday September 4th we’ll cup Neighbors and Crops and on Wednesday September 5th we will feature the LPET Heroes Series in our special Competition Coffees cupping. Sign up for this event in the form below. For those of you who missed out in Amsterdam, here is your chance to get your hands on some of this exclusive coffee with the LPET Tasters Challenge Part II, at our Summer's End Celebration in September. Eight contestants will battle in a triangulation competition, with the extra challenge of identifying La Palma & El Tucán's different fermentation methods and exotic varieties. The winner will take an amazing prize: a full 12.5kg brick of an LPET Heroes Series coffee! The competition will be on Day 2 of the Summer's End Celebration, Wednesday September 5th, in the CCS Oslo HQ. There are a few spaces left for this exclusive event. Complete the form below to reserve yours. You will receive an email to confirm your opt-in. Discover the enormous potential of Valle de Cauca, and uncover some hidden gems. CCS and Fairfield Trading invite you to the 14th annual Valle Cafetero competition in Valle del Cauca, organized by the department’s five FNC coffee cooperatives, and CAFEXCOOP mill. 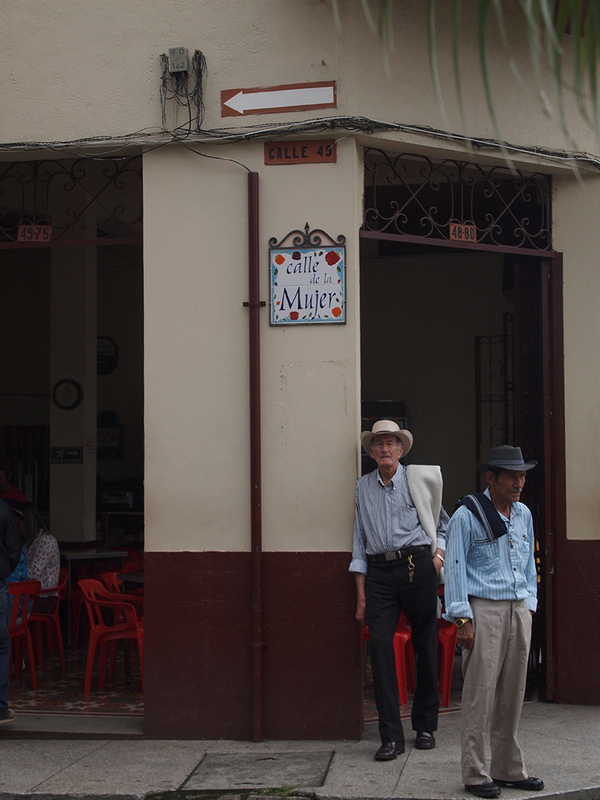 Valle del Cauca is an innovative yet lesser-known coffee growing department of Colombia. This is a rare opportunity to be part of a region’s coffee development, and add some unique and delicious coffees to your menu. July 31: Arrive in Cali, Colombia. Transport to Tulua. Transportation to and from Cali airport, and accommodation in Tulua will be covered by the event organizers. Assessing the top 30 micro-lots selected from 115 “micro-cuencas” in Valle de Cauca. A time for buyers and growers to connect, discuss, network, build relationships, and possibly trade coffee. Our partners in the region, Fairfield Trading, have worked with the group of cooperatives (organizers of this event) since 2002, serving as judges for the Valle Cafetero competition and purchasing winning lots of coffee. Alejandro Renjifo, founder of Fairfield Trading, is from this department, but that is not the only reason for his belief in its coffee growing potential. The exceptional coffees he has recently bought, coupled with the department’s unique approach to community and sustainability, has him convinced that Valle del Cauca will soon be one of the most highly regarded departments on Colombia’s coffee map. Roasters, green coffee buyers and QC managers are invited to join us as judges of the Valle Cafetero 2018. For more information, and to register your interest, fill in the form below. Please include the country code, for example +1 for the US. Thanks for your interest in the Valle Cafetero competition. We will respond very shortly with more information. As an industry we talk about FOB prices, contextualising these figures by describing them in relation to the C-Price or Fair Trade Price Floor. However these numbers don't reflect what farmers actually earn, or what they have to invest to produce coffee of such high quality. Most of us are aware that producing specialty coffee requires a greater investment from the producer, but knowing exactly how much is hard to calculate. Colombian producer, Maria Bercelia Martinez, was an entrepreneur before she was a coffee producer, and her daughter graduated university with an accounting degree. She keeps detailed accounts of her expenses for her farm, Finca Los Angeles, in Acevedo, Huila, and she has very generously compiled and shared some financial information with us. This data, in the downloadable spreadsheet below, provides an insight into the kind of investment required to produce specialty grade coffee. Maria Bercelia Martinez is a unique producer. Almost 70% of the coffee she cultivates achieves scores of 86 or higher, which is a remarkable achievement. But she admits that she is struggling to make ends meet. The costs of production are increasing, but the price paid for coffee does not reflect this. The number one expense is picking coffee. Maria Bercelia pays her pickers 5000 Colombian Pesos (COP) per arroba (12.5kg), plus the family provide food and accommodation. Maria told me the salary of pickers has more than doubled in the last two years, and finding trained pickers who know how to select only the ripe cherries is a challenge for all producers of specialty coffee in her region. The cost of food increased significantly in the last two years, something I can attest to from personal experience, having lived in Colombia from 2011 until early this year. This is due to two main factors. Firstly the country was hit by a drought two years ago. Secondly, the Colombian peso lost over 40% of its value in a six month period in 2014/2015, which caused high inflation and an increase in the cost of living. This impacts Maria Bercelia's costs of production, as she offers food in addition to the pickers' wages, rather than subtracting the cost of food from their salary. This sudden devaluation of the peso also significantly increased the cost of inputs like fertilizers and fungicides (to fight the ever-present threat of coffee leaf rust), which are imported, or use imported ingredients. Drying coffee while maintaining quality is a slow and involved process. 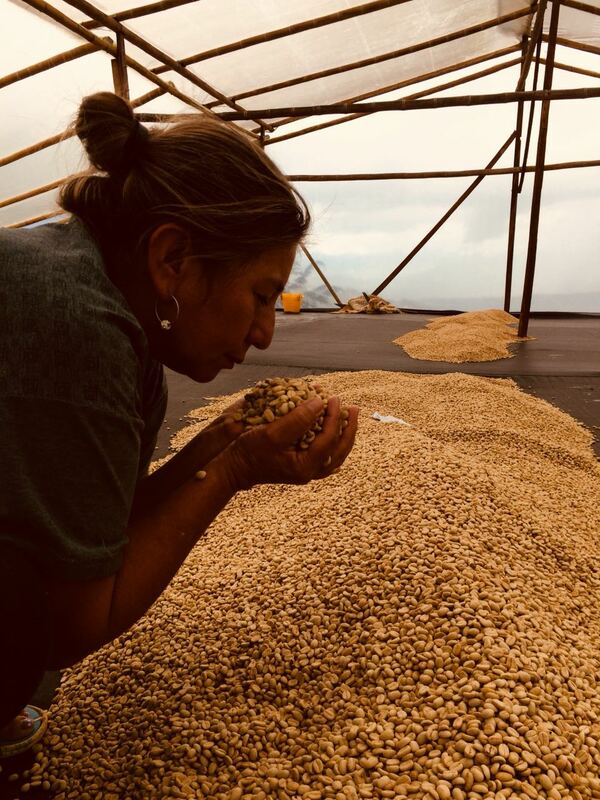 On Maria Bercelia's farm, the coffee spends four to six days in a second story drying bed with a plastic canopy and walls that can be raised to allow airflow, and closed when it rains. The coffee is then moved to a series of raised drying beds. During this process the coffee is moved every couple of hours, depending on humidity, to ensure even drying. This is also the period when the parchment coffee is carefully hand-sorted to remove any contaminants and less than perfect beans, a time-consuming task. The financial information in this spreadsheet was provided by one producer, working on one farm. It is not meant to be representative of all farmers working in specialty coffee, or even all farmers in her region. We do not present this information as verified data, it is self-reported financial information reported directly to us. The estimated day-rates of labor are Maria Bercelia's. The estimated cost in USD is based on an average conversion of COP to USD for the December 2017 to May 2018 period in which Maria Bercelia was paid for her coffee. There are many costs that are not included in this spreadsheet, including the cost of purchasing land, setting up the farm, buying the seedlings, planting trees, building worker accommodation, or the interest Maria Bercelia must pay on the loan she took to keep the farm running when Colombia's coffee prices plummeted. These costs should be considered as part of the cost of production, and without them we decided not to calculate a cost of production per kilogram in the spreadsheet below. Despite its omissions, this is detailed financial information that can enlighten those of use who work in specialty coffee, but don't spend our days on a farm. We see this document as a crucial starting point for a discussion about specialty coffee prices, in Colombia and beyond. Maria Bercelia, and most farmers we have spoken to in the region, all question why the price paid for specialty is linked to the C-Price, and does not reflect the cost of production. For farmers like Maria Bercelia, the latter has significantly increased in recent years while the price they earn for their coffee has not. Next week we will publish data of Maria's production, and the prices she was paid for her coffee from the recent 2017/2018 harvest. Sign up for our newsletter if you would like to be notified when Part 2 of this blog post is live. We welcome your thoughts, opinions, concerns and ideas. Please leave us a comment below. Download the document: Production Costs, Finca Los Angeles. Dos cosas me impactaron cuando conocí a María Bercelia Martinez en su finca en Acevedo, Huila. Primero, que ella y su familia tenían una aproximación diferente al cultivo del café. Segundo, lo unida que era su familia, aún en comparación a otras familias colombianas. Curiosa de saber más sobre ella, le pedí que diera un poco más de información sobre ella. Así fue que ella le escribió esta carta a CCS. No es fácil de leer, en especial para alguien que conoce la generosidad, el afecto y la determinación de esta mujer. Tristemente, es una historia común en Colombia y es posible oír diferentes versiones de cualquier persona que vive en el campo. Eso no la vuelve menos conmovedora o menos importante de leer. Maria Bercelia en su finca, Los Angeles, Acevedo, Huila, Colombia. Gracias por esta oportunidad de contar un poco de mi vida y de mis inicios con el café. En 1982 mis padres se separaron, y tuve que cuidar de mi mamá y de mis dos hermanos menores. En 1984 me casé con José Vianey Erazo, y juntos trajimos al mundo a nuestros tres hijos, Andrea, Diego y Daniel. Mi esposo y yo comenzamos nuestro negocio propio con los pocos recursos que teníamos entonces. Iniciamos con una pequeña ferretería en el pueblo de El Tigre, en el departamento del Putumayo y, gracias a Dios, pudimos comprar un terreno y construir una casa. Con ese hogar, nuestro negocio y nuestros hijos, fuimos muy felices. Habíamos realizado nuestros sueños, y pensamos que podríamos vivir allí toda la vida. Tristemente, no habría de ser así. De un momento al otro, empezó la fiebre por plantar cultivos ilícitos (tales como coca, el insumo necesario para la cocaína) en nuestra región, aquellos que tanto daño le han hecho a nuestro país. Con estos cultivos llegaron las guerrillas y tomaron control del área con la ayuda de “milicianos” (colaboradores de la guerrilla). Fue una época terrible donde se asesinaban personas a diario y muchas veces por razones injustas. Como vivíamos en medio de la zona controlada por la guerrilla, todas las autoridades gubernamentales nos miraban a todos como si fuéramos guerrilleros, aunque muchos vivíamos de nuestros negocios y éramos inocentes. Eramos más los buenos que los malos, pero nos juzgaban a todos por igual. Vivíamos tan tranquilamente como era posible, en la medida en que no nos metimos en problemas y solo nos dedicábamos a cuidar nuestros hijos y atender nuestro negocio. Eso fue así, hasta 1999. A media noche llegaron los paramilitares (grupo mercenario financiado por el narcotráfico y el mismo gobierno para combatir las guerrillas), se tomaron el pueblo y asesinaron a sangre fría y sin discriminación a 32 personas, en su mayoría inocentes. Desaparecieron muchas otras. Quedaron muchas familias destruidas; mujeres solas, hijos huérfanos. A nosotros, gracias a Dios, no nos pasó nada. Nada físico, porque el corazón y nuestra tranquilidad quedaron destruidos. Perdimos muchos amigos. Fue un momento de gran tristeza que marco nuestras vidas. Quedamos sin saber qué hacer ni para donde ir. No queríamos dejar abandonado todo lo que habíamos logrado, nuestro esfuerzo, nuestra vida. Los paramilitares dejaron una amenaza: iban a regresar para rematar a los que nos quedáramos. Esos días nos fuimos a quedar donde un hermano que vivía en La Hormiga, un pueblo vecino. Mirando a nuestros hijos pequeños decidimos que no era el sitio donde debían estar. Decidimos reunir algunos recursos y compramos un lote en Pitalito, Huila, y construimos una casa. Estábamos felices. Era una ciudad tranquila y no se escuchaba violencia por ningún lado. Mis hijos estudiaban en buenos colegios, pero como ni mi esposo ni yo teníamos buena formación académica no fue fácil encontrar trabajo y los gastos de la ciudad eran muchos. Tomamos una decisión difícil. Dejamos a nuestros hijos solos en Pitalito para que terminaran sus estudios básicos y de bachillerato, y nosotros emprendimos un viaje a un pueblo llamado Llorente, en el departamento de Nariño. Era un pueblo dominado por la guerrilla, los paramilitares y el narcotráfico. No era lo que queríamos hacer. No queríamos volver a vivir en carne propia la violencia, pero trabajar como comerciantes en el negocio de la ferretería era lo único que podíamos hacer. Gracias a Dios fuimos muy responsables con nuestros proveedores, quienes nos abrieron sus puertas para iniciar de nuevo con el negocio. En poco tiempo teníamos un negocio bueno y rentable y nuestra situación económica volvía a estar bien. Pero no todo era felicidad. Nuestros hijos permanecían prácticamente solos todo el tiempo. Los podíamos ver cada seis meses cuando salían a vacaciones, pero con la ayuda de Dios, ellos terminaron el bachillerato. Andrea siguió su carrera universitaria como contadora pública y Daniel empezó odontología. La situación en Llorente se tornó critica. Nosotros vivíamos casi como secuestrados. Abríamos la ferretería a las 6:00 de la mañana y cerrábamos a las 6:00 de la tarde. Luego de esa hora nos encerrábamos, porque los grupos armados habían prohibido salir después de esa hora. El que desobedeciera era asesinado. La violencia se apoderó del pueblo y la guerra por el poder no daba tregua. Desafortunadamente, no teníamos opción sino quedarnos; era la única forma de conseguir los recursos económicos para que mis hijos siguieran en la universidad. Eso fue, hasta que asesinaron a mi primo. Nunca supimos por qué fue asesinado, porque nuestra familia nunca se involucró en la guerra o la violencia, pero no estábamos sorprendidos. Los paramilitares contactaron a mi esposo y le dijeron que fuera a recoger el camión que mi primo había estado manejando, que nos pertenecía. Cuando mi esposo llegó, un soldado paramilitar le dijo que no informara del sitio donde lo habían asesinado y desmembrado, porque no tenían planeado regresar el cuerpo a la familia. Pero la familia de mi primo hizo su propia averiguación, encontraron el sitio donde lo habían enterrado, lo exhumaron y le dieron un sepelio de acuerdo a sus creencias. Desafortunadamente, esto creo problemas para nosotros. Los paramilitares pensaron que habíamos sido nosotros quienes les habíamos dicho a la familia de mi primo sobre su asesinato, y amenazaron con matarnos. Tuvimos que dejar Llorente inmediatamente, así que dejamos nuestro negocio atrás. Lo único que queríamos era estar cerca de nuestros hijos y vivir una vida pacífica. De esa manera nos volvimos caficultores. Nos gustaba la idea de trabajar en el campo y con un producto insignia de nuestro país. Compramos la finco Los Ángeles, y comenzamos a cultivar café. Al principio no sabíamos nada del cultivo del café, de la siembra, de la recolecta, de la fermentación o del lavado. Ni siquiera sabíamos como venderlo. No entendíamos qué era el factor de rendimiento y cómo afectaba el precio del café. No endeudamos por qué a veces nos pagaban menos. Afortunadamente somos gente de negocio y emprendedores. Contratamos a un caficultor local para que nos enseñara y aprendimos sobre la prueba de taza y como afecta el precio que se nos paga. Fue ahí cuando decidimos tratar de cultivar café de alta calidad. Pudimos sostener a la familia y, gracias a Dios, mi hija pudo terminar su carrera, cumpliendo mis sueños para ella de ser una profesional educada. Mi felicidad no era completa, y mi corazón todavía duele por Daniel. Cuando el estaba en el cuarto año de universidad (de cinco), hubo una crisis en los precios del café en Colombia. Tuvimos que pedir unos préstamos para cubrir los sueldos de nuestros recolectores; de lo contrario, nos hubiéramos arriesgado a que se pudriera el café en el árbol. Logramos aferrarnos a nuestra finca, pero no pudimos pagar los gastos de la universidad, y Daniel se vio obligado a dejar sus estudios. Hice todo lo que pude para que se volviera una realidad, pero fallé. Hasta este día seguimos pagando los prestamos que tomamos para mantener la finca andando. Esta es la frustración de producir café. Los precios para el café especializado están enlazados con precios inestables de materias primas, aunque es un producto muy diferente. Producir café especializado requiere más dinero, más tiempo, más atención y más determinación. En estos días, todo lo que la fina produce, va a pagar nuestras deudas y no tenemos el dinero para invertir en la misma finca. Vemos los estragos de esto, con una baja producción y una mala densidad en el grano respecto a lo que solían ser. Quisiera a veces que José y yo hubiéramos continuado nuestras vidas en el Putumayo, criando a nuestros hijos y administrando nuestra ferretería. Estábamos bien financieramente, y teníamos los medios para educar a nuestros hijos; pero estábamos rodeados de violencia y no podía mantener a mi familia a salvo. Pero, como dice el dicho colombiano, “no hay mal que por bien no venga”. A pesar de nuestras dificultades, aprendimos el valor de la vida y de la familia. Y, descubrimos el mundo del café! Fue frustrante ver a nuestros hijos abandonar sus estudios universitarios y cambiar sus libros por guadañas y cocos de recolección, pero me siento afortunada porque ahora vivo lejos de la violencia. Estoy enamorada del café, y estoy muy feliz de estar con mis hijos. Me trae mucha alegría trabajar junto a ellos para construir una mejor vida para nosotros mismos. Hemos pensado vender la mitad de la finca para poder pagar nuestras deudas y empezar a re invertir. Buscamos un socio que conozca el mundo del café y que comparta nuestro sueño de producir la mejor calidad. Sé que mi finca tiene un gran potencial y sin la presión de pagar nuestras deudas, podremos vivir una vida más relajada. Pero hay otra cosas que me motivan, como trabajar con ustedes. Con su apoyo y experiencia y el valor que le dan a mi trabajo, puedo sentir que he logrado mis sueños. La experiencia de recibirlos en mi casa ha sido una de las más bonitas, y siempre espero con ansias su regreso al país, para que vengan a visitarme, poder atenderlos con alegría y amor, un buen pedazo de carne ahumada y cerveza. Podemos compartir una charla entre amigos, y poder contarles sobre nuestro esfuerzo para mejorar día a día y así lograr un buen café. Esta es una breve descripción de la historia de mi familia, de donde vengo, las situaciones que he debido enfrentar con mi esposo, que le han dado forma a mi carácter y a mi deseo por ir siempre hacia adelante. Me han salido algunas lágrimas escribiendo esta carta, pero lo hice con gran amor por el equipo de Collaborative Coffee Source. Agradezco su interés en mis origines y en mis sueños. Espero que nos puedan visitar de nuevo pronto! Two things struck me when I met Maria Bercelia Martinez on her farm in Acevedo, Huila. Firstly, that she and her family approach coffee cultivation a little differently. Secondly, her family are especially close, even by Colombian standards. Curious to know more, I asked her to give me some background. So she wrote CCS this letter, which explains her unique perspective on coffee, and the joy her family exude just being together. It also tells a very sad story. This letter is not easy to read, certainly not for anyone who knows this woman’s generosity, warmth and determination. Unfortunately, it is a common story in Colombia and you will hear versions of it from almost everyone who lives in the countryside. That doesn’t make it any less heartbreaking, or any less important to read. I have translated this letter from Spanish, edited for brevity, and I have added some notes in brackets to give context where needed, but as much as possible, I have tried to keep Maria’s story in her own words. We are so honored she agreed to let us share it with you. Maria Bercelia on her farm, Finca Los Angeles, in Acevedo, Huila, Colombia. Thank you for this opportunity to tell you a little of my life and my beginnings with coffee. In 1982 my parents separated, and I had to take care of my mother and my two younger siblings. In 1984 I married Jose Vianey Erazo, and together we brought into the world our three children, Andrea, Diego and Daniel. My husband and I began our own business with the few resources we had at the time. We began with a small hardware business in the town of El Tigre, in the department of Putomayo, and, thanks to God, we were able to buy a piece of land and build a house. With that home, our business and our children, we were so happy. We had realized our dreams, and we thought we would live there forever. Sadly, it was not to be. Suddenly, there was a great rush to grow illicit crops in our region (such as coca, the raw material for cocaine), those that have done such damage to my country. With those crops came the guerrillas and they took control of our area with the help of “milicianos” (guerrilla collaborators). It was a terrible time, people were killed daily, and for unjust reasons. There was no help from the government or military. They viewed anyone who lived in a guerrilla controlled area as guerrillas, even though most of us were merely hard working people living our lives, running businesses, raising families. We lived as peacefully as we could, we didn’t put ourselves in trouble’s way and we dedicated ourselves to caring for our children and running our business. That was, until 1999. That was the year the paramilitaries arrived. These are mercenary armies created to combat the guerrillas, sometimes financed by narco-traffickers, sometimes financed by the government. One night they arrived in the early hours of the morning and took control of the town. That night they murdered 32 people in cold blood and without discrimination. In the following months many more people disappeared, families were left destroyed, mothers became widows, children were orphaned. We thank God nothing happened to us, or that at least we suffered no physical loss. But our hearts were broken and our sense of security was destroyed. We lost so many friends. It was a an era of such great sadness, one that marked our lives. We didn’t know what to do or where to go. We didn’t want to abandon everything we had achieved, our hard work, our life, but the paramilitaries threatened to return to kill all those who remained in the village, so we left. We stayed with my brother in the nieghboring village called La Hormiga, but it was not a safe place for our children. So, we gathered all our resources and bought a small plot of land in Pitalito, Huila and built a house. There was no mention of violence in that region. Our children could study in good schools. We we were happy to be safe. However my husband and I couldn’t find jobs. We never received a good education which made it difficult, and the cost of living in that city was so high. We had an opportunity to open another hardware store in a town called Llorente, in the department of Nariño. It was a town caught between guerrillas, paramilitaries and narco-traffickers. We did not want to return to that violence, but running a hardware store was all we knew how to do. We made the difficult decision to leave our children alone in Pitalito, where they would be safe and could finish high school, and Jose and I moved to Llorente. Our business was successful. We had been very responsible towards our suppliers in the hardware business in Putomayo, and all of them opened their doors when we decided to start again. In a short period of time we were making a profit and our economic situation was once again stable. We were unhappy that our children lived alone. We only saw them once every six months when they could take a vacation. However it was worth the sacrifice. With the help of God, Andrea and Daniel finished high school. Andrea began studying a degree in accounting at the local university, and Daniel soon followed to study dentistry. Sadly the security situation in Llorente deteriorated. Armed groups imposed a nighttime curfew, and to ignore the curfew was to be killed. We lived like hostages in our own home. We opened the hardware store at 6am, and closed at 6pm, then we locked ourselves inside. Violence took over the town and the war for power between different armed groups gave no respite. We had no option but to stay, it was the only way we could afford to keep our children at university. That was, until the day the paramilitaries killed my cousin. We never learned why he was killed, because our family never got involved in the war or violence, but we were not surprised. The paramilitary contacted my husband and told him to come and pick up the truck my cousin had been driving, which belonged to us. When my husband arrived, a paramilitary soldier told him not to inform anyone of the place where they murdered and dismembered my cousin, because they did not plan to deliver the body to the family. But my cousin’s wife, and children did their own investigation and found the place where he was buried. They exhumed him, and gave him a burial according to his beliefs. Unfortunately this created problems for us. The paramilitaries thought we had told my cousin’s family about his murder, and they threatened to kill us. We had to leave Llorente immediately, so we walked away from our business. The only thing we wanted was to be close to our children and to live a peaceful life. This was how we came to be coffee producers. We liked the idea of working in the fields, cultivating the signature product of our country. So we bought the farm, Los Angeles and began cultivating coffee. Maria and her family hired a neighbor to teach them how to cultivate coffee. In the beginning we didn’t know anything about coffee farming, we didn’t know how to grow coffee, how to pick it, ferment or wash it, we didn’t even know how to sell it. We didn’t understand Yield Factors and how they affect the price of coffee. We didn’t understand why sometimes we were paid less. Fortunately we are business people and hard workers. We hired a local coffee grower to teach us, and we learned about cup quality and how it affects the price we are paid. That’s when we decided to try and grow high quality coffee. We were able to support our family, and thanks to God and coffee, my daughter finished her degree, fulfilling my dreams for her to become an educated professional. However my heart still aches for Daniel. When he was in the fourth year of his degree (of five years), there was a crisis in coffee prices in Colombia. We had to borrow money to cover the wages of our pickers, or face letting the coffee cherries rot on the trees. We managed to hold on to our farm, but we couldn’t afford the university fees, and Daniel had to quit his studies. I dreamed he would become an educated professional, and I did everything I could to make this a reality, but I failed. To this day we are still paying off the loans we took to keep the farm running. This is the frustration of producing coffee. Prices for specialty coffee are linked to unstable commodities price, even though the product is different. Producing specialty coffee requires more money, more time, more attention and more determination. These days everything we earn goes to paying off our debts, and we don’t have the money to invest in the farm itself. We are seeing how detrimental this is, production is dropping and our beans have poorer density than they used to. I wish Jose and I could have continued our lives in Putomayo, raising our children and running our hardware business. We were doing well financially, and we had the means to educate our children, but we were surrounded by violence and I could not keep my family safe. But, as the Colombian saying goes “there is no bad that doesn’t produce some good.” Despite our difficulties we learned the value of life and of family. And, we discovered the world of coffee. It was so frustrating to see our children abandon their university studies, and change their books for scythes and collection buckets, but I feel lucky because we live far from violence. I have fallen in love with coffee, and I am so happy to be with my children. It brings me such joy to work together with them to build a better life for ourselves. We have decided to sell half of our farm so we can pay our debts and begin reinvesting. We are looking for a partner who knows the world of coffee and who shares our dream to produce the best quality. I know my farm has great potential and without the pressure to meet our repayments, we could live a more relaxed life. But there are other things that motivate me, like working with you. With your support and experience and the way you value my work, I feel I can achieve my dreams. The experience of having you here in my house was one of the nicest moments of my life, and I eagerly await your return, so I can host you with happiness, love, a good piece of smoked steak and a beer. We can have a chat between friends, and I can show you all the effort we’ve invested in improving and producing great coffee. This is a brief description of my family’s story, where I come from, the situations I’ve endured with my husband, that have shaped my character and my will to go forwards. I shed some tears writing this letter, but I did it with a lot of love for the team at Collaborative Coffee Source. I want to thank you for your interest in my origins and my dreams. I hope you can visit us again soon. Maria with her husband Jose Erazo, and sons Diego and Daniel. Win a Trip to the next CCS Acevedo Cup! Join Collaborative Coffee Source and Fairfield Trading at the Café de Colombia booth on Sunday April 22 for this cupping competition of select Colombians from Huila and Tolima. Hosting this special event is Walter Acevedo, roaster at Amor Perfecto and Colombian Cup Taster Champion 2017, who will go on to represent Colombia at the 2018 World Cup Tasters Championship. Before the competition commences, each cupper will taste the four coffees and learn their origins. There will be four sets of three cups. Two cups in each set will contain the same coffee, the third cup will contain a different coffee. Cuppers must identify the different coffee. Cuppers have four minutes for this task. The finalists are those who correctly identify the different coffee, in the largest number of sets, in the shortest amount of time. Two finalists will go head to head with eight sets of triangulation. The cupper who can identify the different coffee in all eight sets, and correctly identify the origin of the differing coffee in at least five of the eight sets will be awarded the prize. 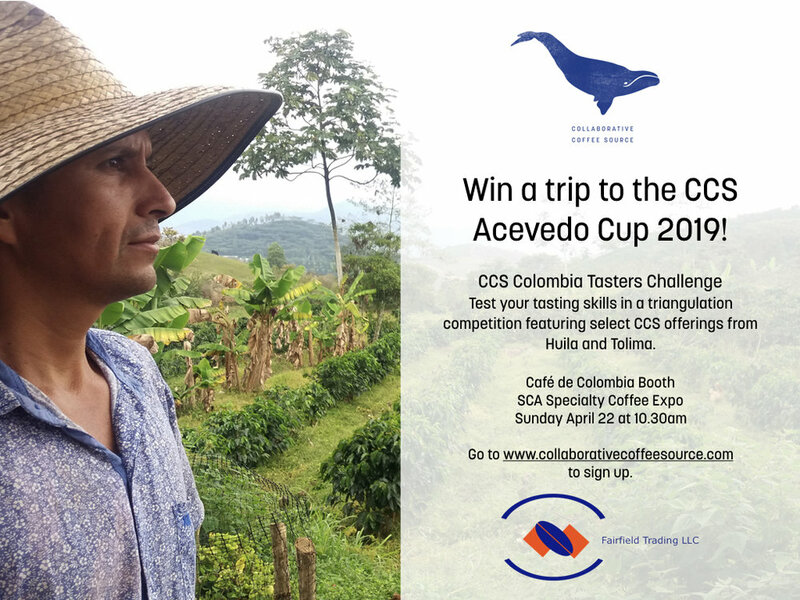 Fairfield Trading will provide the winning contestant with return flights to Huila, Colombia, to attend the CCS Acevedo Cup, 2019! The ten contestant spaces have already been filled. If you would like to be on a stand by list, in case a contestant has to pull out, please fill in the form below. Thank you! The ten contestant spaces have already been filled, but we have added you to our stand by list. Our partners, Fairfield Trading, have committed to developing this region. They have a buying station in Acevedo town, and their professional and dedicated team have developed strong working relationships with producers in the region, advising on agronomic and processing improvements, lifting the cup quality considerably. The first CCS Acevedo Cup was held in December 2016, and the second in January 2018. The intention is to hold an annual event, but of course, we must schedule the competition according to the coffee harvest, which was a little later this time around. The impact of these events should not be underestimated. The recognition and financial reward that comes with placing in the top 20 coffees in this competition is a great incentive to invest the time, energy and money required to produce specialty coffee. The financial reward also allows farmers to invest in infrastructure and plantings that further improve their cup quality. And, above all, events like these bring a community together, which creates an opportunity for collaboration. The Acevedo coffee producing community is particularly strong, with leaders like Ciro Lugo, whose gentle guidance and experience has lifted many farmers into the specialty market. The top twenty lots from the CCS Acevedo Cup 2018 are already in Europe, and arriving soon in the US. To discover these varied and delicious coffees for yourself, see our Colombia offers list and order your samples. Get a head start in the competition. Read all about the coffees we'll present for the CCS Colombia Tasters Challenge. Full farmer information sheets can be downloaded from this Dropbox folder. Astrid Medina with Eduardo Urquina (left) and Alejandro Renjifo of Fairfield Trading, and Robert W Thoresen of CCS. We are in awe of Doña Astrid, both as a producer and as a person. Growing up in a part of Colombia that was one of the worst affected by the country's internal conflict, Astrid suffered, like most of her friends, family and neighbors. But Astrid found purpose in coffee and family. Her dedication to her finca and her coffee inspires us. Download the Astrid Medina Farmer Information Sheet. Jair was the winner of the CCS Acevedo Cup 2018. The announcement of his name elicited a gasp from the audience, as the young producer is only 26! We are obviously watching this producer very closely. Download the Jair Caicedo Farmer Information Sheet. Julio is a second generation coffee producer who inherited his lot of land from his parents. He was inspired to work towards producing specialty coffee when his neighbor, José Arangel Rodriguez, won a specialty competition organized by the Colombian Coffee Growers Federation (FNC). Realizing the potential for the region, Julio and his wife Yanet Rincón requested training in cultivating, collecting and processing for quality, and sold their first specialty lot to Fairfield Trading in 2017. Download the Julio Olaya Farmer Information Sheet. Julio Olaya, a new entrant to the specialty market. Another rock star of specialty coffee, Maria and her family stand apart from most coffee producers, possibly because they are all first generation farmers. Previously the family ran a hardware store in a part of Colombia badly affected by the internal conflict. 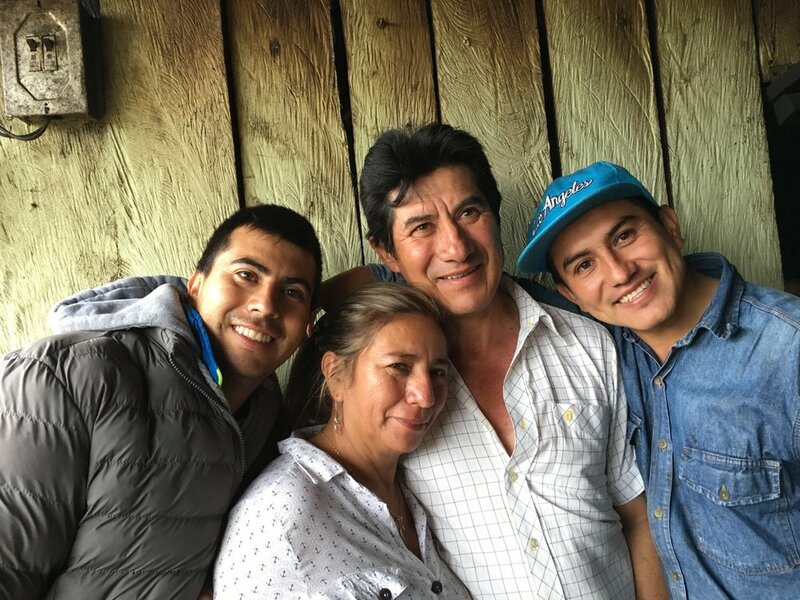 For their safety, and to build a more stable financial future, Maria and her husband Jose Erazo purchased a plot of land in Acevedo, and the entire family began cultivating coffee. Maria's farm, Los Angeles, has a set up unlike any other. Without generations of knowledge and tradition, the family approach each challenge with a fresh perspective, a difference that can be tasted in the cup. Download the Maria Bercelia Farmer Information Sheet. From left: Eduardo Urquina and Alejandro Renjifo from Fairfield Trading, Astrid Medina, and Robert from CCS. Astrid was visiting Acevedo during the CCS Acevedo Cup 2018 to support and learn from her coffee producing peers in Huila. Within 30 seconds of meeting Astrid Medina, she invited me to her finca. She invites everyone, and her invitation is genuine, she would really love to show you her home and her coffee. She is a rockstar of specialty coffee with fans across the globe, but Astrid is a caring and humble person, grateful to coffee for what it has given to her family. Astrid is from Planadas, Tolima, an area of Colombia that suffered the some of the worst of the Colombian internal conflict, caught between the FARC guerrillas, the government, the narco-traffickers and the paramilitary groups. People of this region tend not to talk of this violence. Everyone has a story. Everyone suffered. As Colombia begins its journey to peace, these people are looking forward, not backwards. I asked Astrid to answer a few questions for me, and what she provided was this heartfelt essay. Rather than edit it into our usual style of blog post, I decided to post it as is. It has been translated from Spanish, and modified slightly for flow, but it remains Astrid's story, in her own words. My farm, Buena Vista, is located in the municipality of Planadas in Gaitania, Tolima at an altitude of 1780 to 2000 metres above sea level. The varieties I grow are Caturra, Colombia and Castillo. The total area of my farm is 15 hectares of which 13.5 a dedicated to coffee production. My coffee is cultivated, picked, processed and dried with upmost care to maintain the quality. Quality is our primary objective when working with coffee. My paternal grandfather was a coffee producer, my father was a coffee producer, and the family of my husband were all coffee producers. When I was 29 years old my father, Aureliano Medina, was killed. My three younger siblings and I inherited the farm. Two of my siblings sold their share, so now Buena Vista is owned by my husband, my younger sister and me. It hasn’t been easy, it is a constant struggle to be a coffee producer, the price, the climate, the varieties, the work that must be done by hand. But it is a passion and an art, and we never stop learning. I began producing specialty coffee in 2014 when the National Federation of Coffee Growers and Nespresso launched a program called LH TIME, or Late Harvest, which was just for the Castillo variety and consisted of collecting the mature cherries. In our case we picked the cherries over four weeks to obtain the best state of ripeness of this variety. We managed to sell 5000 kg of coffee in parchment at a premium of 300,000 pesos (approximately an additional $100 USD per 125kg). This additional money really helped us to make investments in our farm to implement more processes to achieve better quality and improve salaries of our workers. In 2015 they held the Cup of Excellence in Colombia and we decided to enter, it was held on the 13th of March, and our coffee won first place! This competition changed our lives. It not only proved that quality coffee is worth the effort, it also proved that hard work and dedication bring good things. This competition lifted us from anonymity and introduced us to the world of specialty coffee. Many people were suddenly interested in visiting our region, tasting and buying coffee from Planadas. This really helped our region which was hit hard by the internal conflict in Colombia. The coffee producers improved their conditions, could invest in their farms and improve salaries for their workers. Specialty coffee changed my life and that of my family for the better. It allowed us to improve infrastructure, improve the salaries of our workers, and gave us the opportunity to travel abroad, encounter new cultures, to meet with the people who had come to visit us on our farm. Coffee really unites people. Specialty coffee allows us to educate our children and support my daughter who is studying at a university in Bogota. It has returned my sense of security, my will to work, to listen, to travel, to learn, to dream. My husband is Raúl Antonio Duran, my daughter is Dayhana Alejandra Duran, she is 19 and is in the sixth semester of an environmental science degree at Universidad El Bosque, and my son Raúl Alejandro is 9 and finishing 4th grade. My husband is a medical veterinarian, and I am an agricultural production technician. We have always worked in coffee. Before we inherited the farm, we worked for a coffee cooperative, and my husband continues to work as a buyer. In my free time I help with physical analysis, and this has really helped us to learn more about coffee. My husband has a good head for finances and is an excellent administrator. This has given me the opportunity to participate, to learn, to contribute, and it has really helped us to grow and work towards the same goal. We work as a team. To be a woman in the Colombian coffee sector is a crucial role that requires great commitment, work, dedication and above all, great passion for what we do. Gender equality is so important. In coffee there is always work for every member of the family, and it is very important to empower those who want to work. Men and women always complement each other and both are important. Both are in charge of what they do, both develop a role very important in their family. My plans for the future are very ambitious. I want my farm to be a place that does not harm the environment, where many varieties of coffee exist, where there are many ornamental and fruit trees, where we never want for vegetables. I want to have the highest standard of water treatment, to offer my workers training, and above all we want to learn more ourselves. We want to have some means of air transport to bring the picked coffee from the highest lots to the washing station. I dream that my children will speak English, finish their university studies, and be in love with coffee. I am very proud of my farm, it is the legacy of my father, but I am prouder of the coffee that we produce. It is wonderful and privileged position to offer specialty coffee, it gives me great satisfaction and fills me with gratitude. I am proud to know that we have placed one grain of sand in building the country of our dreams. The December 2017 harvest, Finca Buena Vista, Planadas, Tolima, Colombia. All photos courtesy of Raúl Durán. Astrid's award winning coffee is available in the US. See our North America Offers to order a sample. You’re invited: The second annual CCS Acevedo Cup 2018 with Fairfield Trading will be held next month in Huila Colombia, from the 17th to the 21st of January. Come and explore the beauty of Acevedo, discover the exceptional coffees of this region of Huila, and spend time with these dedicated Colombian farmers. Email info@collaborativecoffeesource.com to reserve your place. The core of our business at CCS is connecting roasters to producers and forging long term relationships. The CCS Acevedo Cup is one of the most enjoyable and satisfying ways we achieve this. It is hard to overstate the importance of having roasters attend this event. Their presence as judges and observers makes the farmers feel connected to the markets, and valued for their hard work and investment. The cupping team, CCS Acevedo Cup 2016. Clockwise from top: Ria - Four Letter Word, Dillon - Parlor Coffee, Eduardo - Fairfield Trading, Melanie - CCS, Tali - Barismo. In 2016, twenty coffees were selected as finalists for the CCS Acevedo Cup. When interviewed by Eduardo Urquina of Fairfield Trading after the event, all twenty expressed their gratitude to the roasters who attended, and described their pride at reaching the top twenty. Very often, farmers are unaware of the quality of the coffee they produce. By entering the CCS Acevedo Cup they receive useful information in the form of cupping scores and tasting notes. This data serves as both recognition of their labors, and incentive to continue investing and improving their coffee. Jon Wilson Poveda almost didn’t enter the competition. “I knew of the CCS Acevedo Cup,” he said, “but I hesitated to enter and I didn’t imagine I could win, because I knew that my fermentation and drying facilities were not helping to process the coffee well.” Jon inherited part of his farm, called “Danny” in La Marimba, and decided to buy another lot of land to increase production. Unfortunately that meant he didn’t have the funds to expand his fermentation facilities or improve his drying beds. In 2016 he also couldn’t find enough labour to pick his cherries fast enough, a common problem in the region. However Eduardo Urquina of Fairfield Trading convinced Jon that several lots of his coffee were worth entering, and Jon won tenth place. Jon credits the forest reserve that borders his property for the quality of his coffee. The farm, which sits 1829 masl, draws water from the mountains to irrigate the coffee trees. Sunset at Finca Bella Vista, living up to its name. The CCS Acevedo Cup is financial proof that specialty coffee can be sustainable for coffee farmers. “Selling traditional coffee isn’t profitable,” said Maria Bercerlia Martinez of Finca Los Angeles in La Marimba. 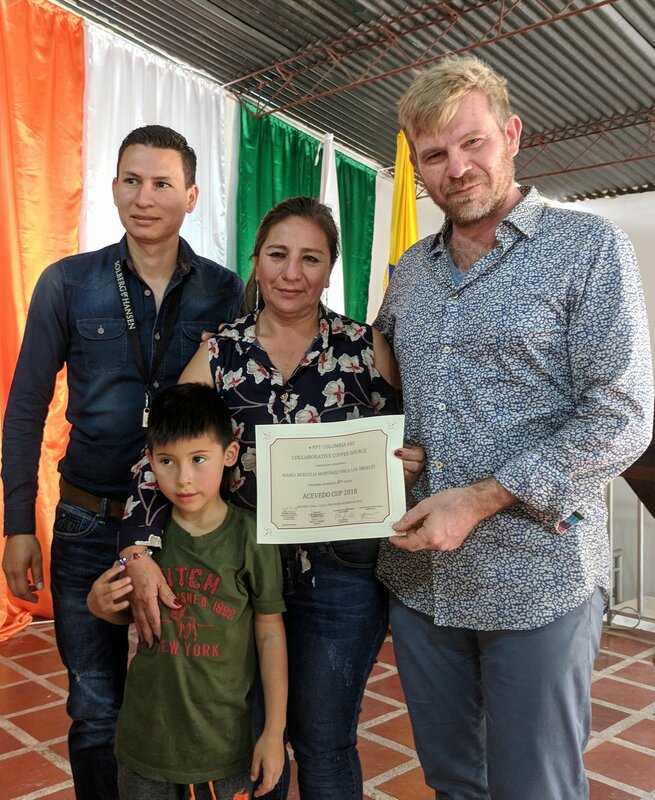 With help from Fairfield Trading, Maria and her family have invested in improving quality in order to enter the specialty market, and their work was recognized when two lots of their coffee placed 9th and 20th. Wilmer Cuellar of Finca Las Brisas in La Estrella was so proud to win 11th place, as it proved that producing high quality was financially viable. “I felt so happy to be representative of the group showing that quality coffee is the solution,” he said. One of the best outcomes of the CCS Acevedo Cup are the relationships that are forged between roasters and producers. Join us for the CCS Acevedo Cup 2018, Jan 17 to 21st and be part of this special event, recognizing the great work of farmers in the Acevedo region, and the exceptional coffees they are producing. Email info@collaborativecoffeesource.com for more information. Join us for the second CCS Acevedo Cup by Fairfield Trading and Collaborative Coffee Source. Places are limited. Email info@collaborativecoffeesource.com to book your place. The CCS Acevedo Cup is valuable in so many ways. For roasters it offers a condensed experience of a region, a chance to meet many farmers and cup their coffees at once, to see their land, engage in their community, understand their hopes and plans for the future. For the coffee growing community of Acevedo it offers a chance to meet the people who buy, roast and serve their coffee, to learn about the markets where their coffees are sold, and the impressions of the consumers who drink the final product. The CCS Acevedo Cup also offers the farmers a reason to get together, to share knowledge, skills, experience and stories. And, of course, cupping competitions like these offer recognition for the hard work of the farmers. This recognition, combined with the financial reward for the winners, incentivizes continued effort to produce high quality coffee. Alexander Ordoñoz, proud third place winner of the CCS Acevedo Cup 2016. The inaugural CCS Acevedo Cup ran in December 2016, which means this event is delayed slightly. Unfortunately weather has been working against the farmers of Acevedo this year. Heavy rains caused later flowering, and as we are seeing in so many regions, the harvest has been delayed. It happens in agriculture — there are good years and bad years. Sadly for the Acevedo community, this isn’t a great year. Regardless, there will be some great coffee to cup come January. Rather than cancel the event, we decided to postpone it for one month, giving farmers a little more time to harvest and process their coffee, and to give our partners Fairfield Trading the time to properly cup and select the best entries for the competition. Both Fairfield Trading and CCS are enormously proud of this event, and we are committed to recognizing the hard work and delicious coffee of the Acevedo coffee growing community, in good years, and not so good years. We look forward to sharing this experience with you. Email info@collaborativecoffeesource.com to book your place. Twenty years ago Antonio Saavedra sold his farm at 1200 masl in Tolima, Colombia, and bought another further up the hill at 1715 masl. Yep, twenty years ago. Before anyone was talking about global warming and its impact on coffee, Antonio realized that temperatures were rising and it would soon be impossible to grow great coffee on his lower altitude farm. To reach his current farm called El Placer, located in the San Antonio municipality of Tolima, you have to travel one and a half hours by horseback from the nearest road. It’s the kind of trip Antonio is accustomed to making. He once travelled eight hours by horseback to reach the town of Planadas in Tolima, in order to deliver a sample of his coffee to Alejandro Renjifo from Fairfield Trading, our partners in the region. Things are spread out in that part of Colombia and roads don't always take you where you need to go. This is why Antonio created a school on his property. Seven children from neighboring families attend the school, which covers both primary and secondary curriculum. Of course, "neighbor" is a relative term. Their farms are quite far from Antonio’s, too far for the kids to travel back and forth on a daily basis. So they arrive Monday morning and stay until Friday afternoon. Their teacher is also the head cook and chief caretaker. She walks one and a half hours up the hill to Antonio’s property on a Monday morning, then teaches, cooks and cares for the kids until they all go home on Friday. Next to the school building is a vegetable patch and part of the kids’ daily activity is to maintain the garden and prepare meals using the vegetables they have grown. The kids could attend a government school, but it is further from their homes than Antonio's farm, and it doesn't provide housing during the week. If it wasn’t for the school Antonio built on his property for his neighbor's children, it is unlikely they would get a continuous education. The dedication of the teacher and the children is a reflection of Antonio’s own serious approach to life and work. The quality of his coffee is a result of daily persistence and willingness to learn. Antonio renovates his farm regularly to keep the trees young. His pickers are trained to collect only the ripe cherries which he depulps immediately and ferments for 36 hours in lidded containers filled with just enough water to cover the cherries. He washes the coffee up to four times to remove all trace of mucilage, and dries it slowly in a solar drier for around 15 days. He personally inspects every truck that will transport his coffee and accepts only impeccable cleanliness, his last chance to ensure his precious product isn’t contaminated by a smelly truck on its way to a buyer. Coffees from Tolima and Huila are arriving very soon in the US. Contact Sal on the East Coast and Colleen on the West Coast to get your samples.